Our free trial for truck route planning software offers everything you need to start optimising your routes and helps you reduce costs. By the time you begin to use PTV Map&Guide, you can calculate your CO2, toll and personnel costs in advance, plan routes in seconds, save time from unnecessary detours, and most importantly, identify and increase profitable orders. 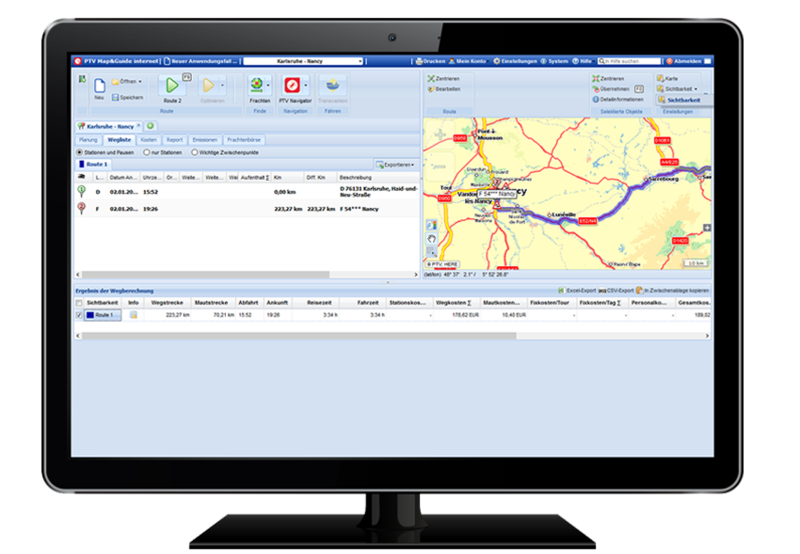 Whether you own a small or a large road freight transport company, PTV Map&Guide is your new powerful truck dispatch and truck route planning software. Make informed decisions based on exact costs with detailed insights, and then reap the rewards in months and years to come. PTV Map&Guide enables you to send accurate invoices and delivery quotes with confidence with state-of-the-art calculators. 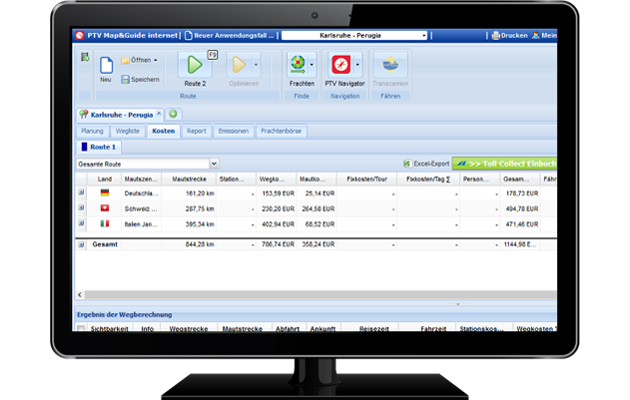 Our truck route planning software saves you time and effort from doing manual toll cost calculation and makes sure it is always accurate. Calculate all toll road charges in Europe; including bridges, tunnels and cities, as well as HGV levy with PTV Map&Guide. Evaluate the gross minimum wage and salary costs for truck and HGV drivers efficiently and realistically. The PTV Map&Guide database includes all statutory restrictions in Europe and accesses these for comparison purposes during staff cost calculation. Calculate your exact transport costs with our clear and reliable transport cost calculator built into the software. With PTV Map&Guide, you can incorporate exact costs into your quotation and avoid unprofitable orders and maximise profit. Run a detailed CO2 calculation and reduce carbon footprint with the software’s CO2 calculator. You can view it as a report which gives you a complete and demonstrable competitive advantage to promote green logistics based on PTV Map&Guide’s various parameters. Managers, planners and dispatchers gain full visibility and control over the entire planning & optimisation process by using our truck route planning software. This is how PTV Map&Guide ensures higher levels of satisfaction for all employees using the software. It is not only installed on-site, but the truck route planner is also available online so that you can access it anywhere, anytime. Plan perfectly-tailored routes for your vehicles. PTV Map&Guide automatically avoids all roads unsuitable for trucks, HGVs, or hazardous materials by setting the vehicle’s parameters and truck-related attributes beforehand. Our truck route planning software optimises everything with one click. Our guided truck navigation feature avoids discrepancies between planned and travelled kilometres intuitively. This way, the driver can follow the route on the map exactly as planned following the truck attributes to prevent any undesired driving detours and deviations. Just download our free truck navigation software to your driver’s smart devices and pair it with PTV Map&Guide. Import and manage your customer data easily using Excel CSV file, in a list or visualised on a map with PTV Map&Guide’s built-in data manager. Once the customer and route address data are imported and categorised, they appear directly in the route planner's maps for easy viewing. Get 7-day access to PTV Map&Guide. Start planning and optimising your routes now.